For much of the past five centuries, the history of the European continent has been a history of chaos, its civilization thrown into turmoil by ferocious wars or bitter religious conflicts - sometimes in combination - that have made and remade borders, created and eliminated entire nations, and left a legacy that is still influencing our world. This 36-lecture series from an award-winning teacher and honored scholar pursues an explanation for this chaos that goes beyond the obvious ones of political ambition, religious intolerance, the pursuit of state power, or the fear of another state's aspirations. In pursuing that explanation, Professor Liulevicius offers everyone interested in the "why" of history a remarkable look into the evolution of the European continent and the modern state system. His provocative lectures allow us to peer through the revealing lens of statecraft to show us its impact on war, peace, and power and how that impact may well be felt in the future. 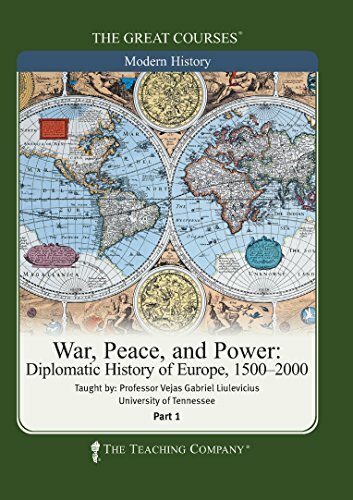 As you learn to examine key points on history's diplomatic timeline in the context of attempting to establish - successfully and not - a lasting idea of order in the European world, you'll begin to grasp the key Professor Liulevicius offers to understanding the dynamics of international politics. And you'll see how such key concepts as the balance of power, power itself, sovereignty, and "reason of state" - the raison d'état first enunciated by France's powerful Cardinal Richelieu - fit into those dynamics. If you have any questions about this product by Brand: The Teaching Company, contact us by completing and submitting the form below. If you are looking for a specif part number, please include it with your message.